E3 2016, a show focused primarily on the latest games for PCs and consoles, maintained a strong focus on virtual reality (VR) this year. With Facebook’s Occulus Rift VR headset now available, high-end PC gamers with the proper hardware and the $599 to spend on the peripheral will enjoy the current state-of-the art in VR. Occulus’ booth maintained long lines all day for those looking to test out both the headset and its new Touch controllers on a series of multi-player demonstration games. All in, a properly configured PC and Occulus Rift bundle runs at least $1,500, with most bundles starting at $2,000 and up. Sony, on the other hand, has achieved great success with its latest PS4 console, with sales far outpacing its rival, Microsoft, and its Xbox One. 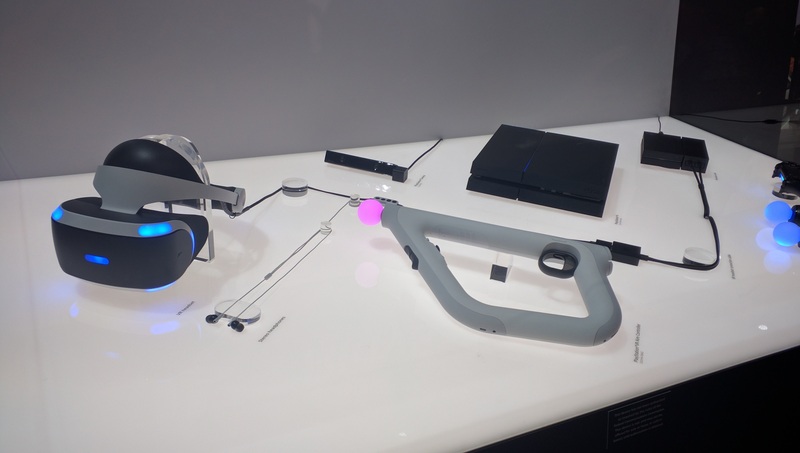 While Microsoft announced and showed a slimmed down non-functioning Xbox One S that supports 4K media playback (not 4K gaming), Sony chose to show off its VR peripheral, the PSVR that was announced at the Game Developer Conference back in March. Shipping on October 13, at $399, Sony promises that all 40 million PS4 consoles shipped to date will support the PSVR and that 50 VR titles will be available at launch. Current PS4 owners will need to add a PlayStation camera accessory ($60) and will likely want to add two PlayStation Move controllers ($30 each) to fully enable the PSVR. This increases the total system cost including the console to roughly $870 – not for the faint of heart, but easily half the cost of a full PC-based Occulus rig. While the PSVR’s visuals run at 1080p HD resolution – far lower than the Occulus – mainstream console gaming remains at standard HD and likely good enough for most gamers until 4K becomes a widely available standard. Sony’s success with its current generation console has garnered a large developer base already lined up behind the company to support the PSVR, making the PS4 platform with the best shot at bringing VR to the masses. This entry was posted in TRENDFOCUS Blog, Uncategorized and tagged Console, gaming, PS4, PSVR, VR. Bookmark the permalink.